While the 'Arab tenant class' of Madhi hardly involves in working on the land of Waha any longer, the education and compensations they received from the government have strengthened their 'Arab tenant' identifications. These set them apart from the Hausa and Southern families and 'pastoralist' women who continue to work the land of Waha for below subsistence wages. Together they reorder the terms of cultivation and along strict racial, gender and geometrical lines. Almost all ‘tenants’ who bought their tenancy through becoming a shareholder of the Cooperative were absentees from Khartoum who rented out their tenancies. 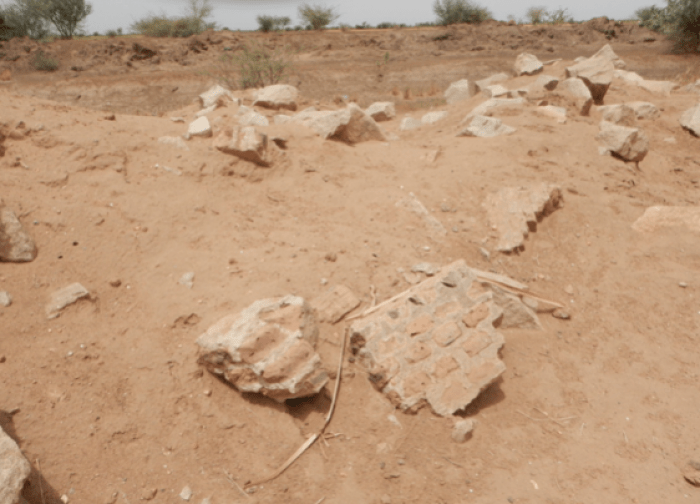 Many from the ‘tenant village’ of Madhi started to rent in 10 to 30 acres from the absentees and employed migrants from West Africa and Darfur to do most of the cultivation. For three years they grew cash crops financed by the government and the Cooperative: wheat, cotton, sesame. Their success was short lived however. When the Kuwaiti withdrew their support for the scheme and inflation impeded high input agriculture by the Cooperative, the people that were absent in the formal partnership changed the terms of cultivation. After failing to recover its costs for land preparation and inputs f the Cooperative halted the financing of its operations. Without the financing and management of the cooperative for cash crops the cultivators from Madhi shifted to cultivation for ‘local production’ by local investors. 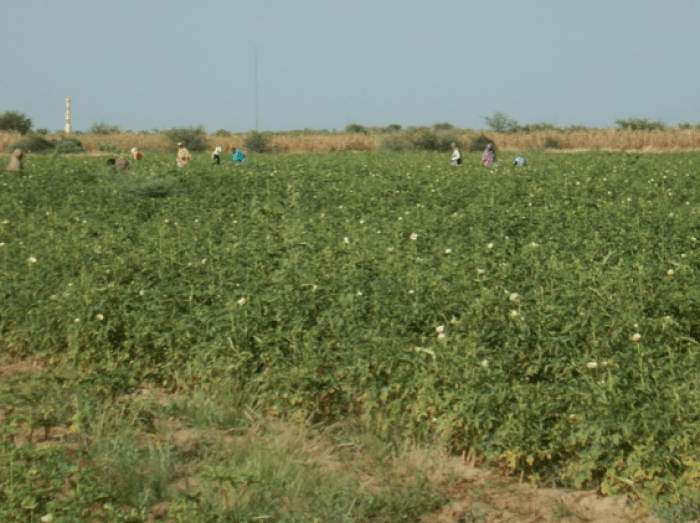 Those who could access water and finance labour involved in cultivation vegetables which they sold in the Khartoum market. At places where access to water was insecure, sorghum was grown for fodder which needs only one irrigation. Increasingly the land was taken over by a few local investors who have their own tractors, lorries, and harvesters. Between 1995 and 2005 the Waha scheme was supported by the government of Khartoum State, which ran the pumps intermittently. Both the state government – which failed to recover their operational costs – and Amar and Yasir – who regard the low value fodder crop as unproductive – see the low input ‘local financing’ model which had been established as a failure. Canals silted up and irrigators took water whenever they could. When the Kuwati’s wanted to liquidate the main infrastructure in 2001 the Cooperative indicated it was interested in buying their share to ‘revive’ the scheme. The State governor decided differently however and leased the land to COM for 25 years. What followed was a violent encounter between the people of Madhi and security forces. Capitalizing on the earlier translation of land into fixed plots of land they fenced off the land. Many from Madhi who protested were beaten and jailed for a few days. Faced with continuing resistance COM agreed with the government and the village leaders that people from Madhi would retain control over the plots they received as a compensation when the scheme was established. To compensate COM for this loss they granted the company a 5000 acre expansion of ‘desert land’ near El Hosh. 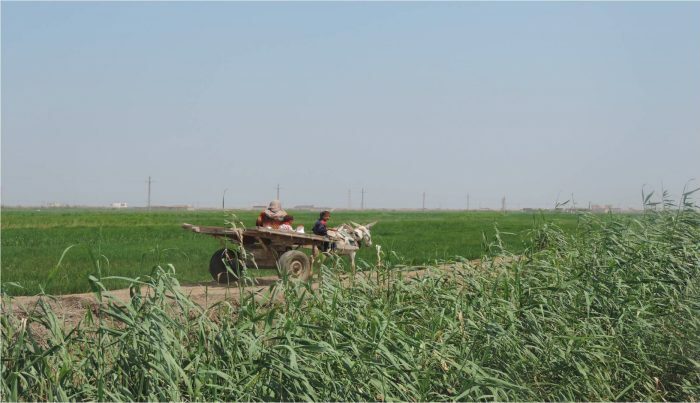 The landscape around Madhi and El Hamda was thus once again hauled over. COM’s caterpillars bulldozed the rectangular grid that was created 25 years earlier to replace it with a fenced irrigation scheme with more than 100 pivots of around 60 ha each. The minor canals of the old scheme were demolished up to the fence and replaced with a zig-zag pattern between the pivots. At the tail end they were connected to the remainder of the smallholder irrigation scheme. While water supply to the remaining smallholder plots of Waha has been more reliable and cheaper than in the years before COM, water provision to the smallholder plots remains a challenge as the smallholder canals are not maintained by COM or the Government. 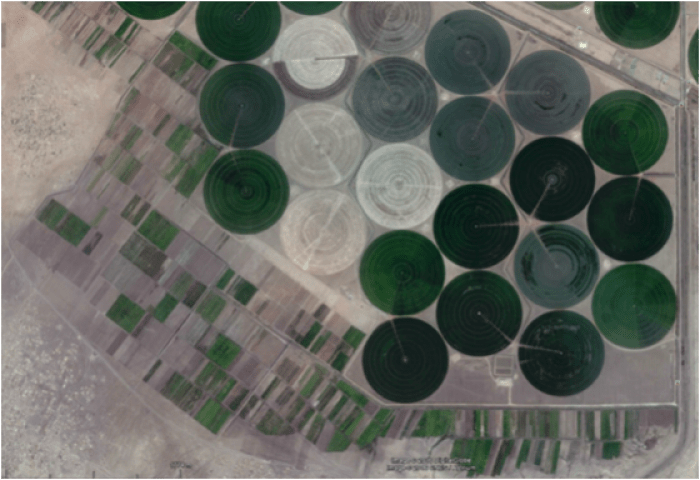 The contrast with the pivot irrigation scheme is large. The new circular irrigation system established by COM is high-tech and well maintained with limited labor requirements. Whereas between 1990 and 2010 more than 2000 people worked in the Waha scheme, COM currently employs some 600 people at Waha. Many from Madhi have disengaged from farming since COM took over most of the scheme. It would be too easy to attribute this shift solely to the company however. While almost all at Waha condemn the violent appropriation of most of the land and water by COM, their relation is not just about distribution of land and water. To better appreciate the relation between COM, Noel and Amar we turn to the mills and shops that supply the people of El Hosh and Madhi with grains.